Last week we celebrated all things great of Dr. Seuss with book readings, poems, and special activities that included wearing a hat to school (crazy or favorite), Dr. Seuss colors (black, white, and red), pajamas, and our favorite, crazy hair. Of course, my daughters were super excited, especially my young one because it was going to be her very first crazy hair day at school. 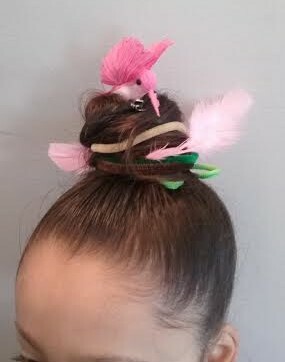 We decided to turn a hair bun into a birdie’s nest by taking brown, tan, and green pipe cleaners and twisting them around the bun so they could look like twigs and leaves. Then we stuck several feathers in and last but definitely not least, the main attraction was these little paper birdies that we found at AC Moore craft store. 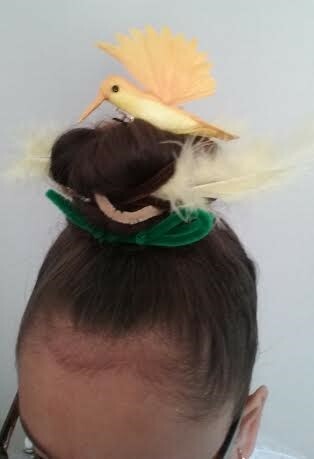 It was easy to attach the birds onto the bun because the birds already had a metal hair clip. Of course, these buns can be decorated more and taken to another level, but like I said before, I wanted to keep things simple. My girls were super happy with the results (mission accomplish!) and ready to participate in crazy hair day. Take this idea and let your imagination and creativity fly!